Payment of fees by cheque, will be received in the School Accounts Office, from Monday to Friday, from: 11:30 a.m. to 2:30 p.m. 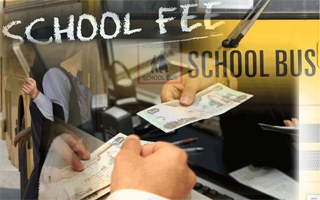 The name of the pupil will be struck off the register for Non - Payment of fees for a period of 3 months. Fees for any month must be paid by the 15th of the month, Fees paid after the 15th of the month for which they are due will be accepted only if paid with a fine of Rs. 50/- per month at cumulative form. A month's notice must be given before a child is withdrawn from the school, or a month's fees paid in lieu of notice. No deduction is made for the absence of children during holidays or for broken periods. Please keep Identity Cards carefully as they will not be replaced in the same academic year. Cheques should be made payable to Loreto Day School Sealdah, current a/c. The school reserves the right to increase the fees at any time of the year if an increment is considered necessary. Five Percent annual increase in the tuition fee or any other is normal.